You don't have to be the late Roger Ebert to know that movies run in cycles and that trends can often rule the industry. I often feel like I'm writing the same things over and over as these things go in and out of vogue. Found footage movies and remakes have certainly dominated these discussions. We've also talked a lot about belated sequels. As Hollywood seems to steer further and further away from original ideas, we've seen the dust blown off of titles and characters which haven't seen the light of day in years. Titles like Scream 4, Wall Street: Money Never Sleeps, and the upcoming Independence Day: Resurgence suddenly appear to attempt woo a generation which may not have heard of the original film. Now, Zoolander 2 joins this club. Zoolander 2 picks up not long after the events of Zoolander. Vapid male model Derek Zoolander (Ben Stiller) loses his wife in a freak accident, which also disfigures his best friend, Hansel (Owen Wilson). Now, Derek is he’s left to raise their son alone, which he can’t handle, and soon Derek Jr. is taken away by Child Protective Services. Following this, Derek goes into hiding. Years later, Billy Zane arrives on Derek’s doorstep with an offer to visit Rome and model for hot designers Don Atari (Kyle Mooney) and Alexanya Atoz (Kristen Wiig). Zane delivers a similar message to Hansel. When Derek and Hansel meet in Rome, there is an awkward reunion, but they are soon excited for the show. Meanwhile, Derek learns that his son is in Rome as well, and he attempts a reunion. However, Derek and Hansel soon find themselves involved in a conspiracy which threatens the entire world...well, the world of fashion. When Zoolander was released in 2001, it was a minor success, but it found life on home video and has become a cult hit. So, a sequel wasn’t necessarily a surprise. The surprise was that it took nearly 15 years to get here. In that time, Stiller has remained busy and in the spotlight, but his films have had varying degrees of success. It would be unfair to say that Stiller made Zoolander 2 to resurrect his career. It’s much more realistic to say that it’s a love letter to the fans. And, as a fan of Zoolander, I was certainly interested in seeing this sequel, even if I was scratching my head and wondering why Stiller waited so long to do it. What I found was a movie which plays like a pros and cons of what a belated sequel should do. On the positive side, Zoolander 2 brings back the titular character (as one would hope) and Hansel as well. These two guys have not changed, and, if possible, they are actually less smart here than they were in the first film. The film mocks the fashion industry and the absurd nature which high fashion often assumes, just as the original did. Stiller shows that he has no intention of backing away from the bizarre humor which made the first movie work. However, Zoolander 2 also seems very determined to make us remember that there was an original film. We get several recycled jokes and gags here, most of which feel like a desperate attempt to make a connection to Zoolander. It would been OK if this sequel had started with something familiar and then worked its way into a new joke, but some of these moments are nearly copies of the first film. While it was necessary to bring back the heroes, Zoolander 2 could have used a new, fresh villain. Having Derek go up against his old nemesis makes sense on paper, but when you realize that this leads to a lot of the same old jokes, it makes one wish for some new blood. The cameos in Zoolander were funny, as most of them illustrated how celebrities hover around the world of fashion. Zoolander 2 is packed to the gills with cameos and it feels more like, “Hey! Look who said ’yes’ to being in the film.” The addition of Derek Jr. (Cyrus Arnold) makes sense, but he comes across as so annoying that it’s difficult to get behind this part of the story. This is not to say that Zoolander 2 is a complete disaster. There are some very funny moments here and I found myself laughing out loud on more than one occasion. But, I also found myself shaking my head at the missed opportunities as the movie opted to trot out reused gags instead of opting for something new. 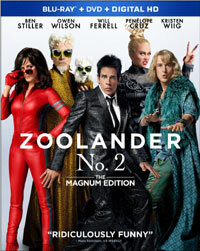 Stiller has proven himself to be a filmmaker who isn’t afraid of taking chances, but one gets the feeling that he held back and played it safe with Zoolander 2, which leaves the audience with something with feels more like Zoolander 1 ½ .
Zoolander 2 sort of feels like a glorified vacation in Rome on Blu-ray Disc courtesy of Paramount Home Entertainment. The film has been letterboxed at 2.35:1 and the Disc contains an AVC 1080p HD transfer which runs at an average of 27 Mbps. The image is very sharp and clear, showing on overt grain and no defects from the source materials. The colors, which are very bold and true, look great and the image is never overly dark or bright. The level of detail is impressive, as we can make out textures on objects and the depth looks good as well. The Disc carries a DTS-HD Master Audio 7.1 track which runs at 48 kHz and an average of 6.5 Mbps. The track provides clear dialogue and sound effects. The in-film music sounds great, providing throbbing bass at times. The stereo and surround sound effects are abundant and nicely detailed. We get a nice amount of effects which represent sounds coming from off-screen. The Zoolander 2 Blu-ray Disc contains just a few extras. "The Zoolander Legacy" (9 minutes) looks at the first film and how it achieved a cult level of success and how this lead to the sequel. The cast and creative team share stories of how the first movie has spread across the world and their approach to Zoolander 2. "Go Big or Go Rome" (8 minutes) examines the location shooting in Rome, and has Stiller explaining his motivation for setting the film there. This includes a nice amount of on-set footage, showing the great locations. "Drake Sather: The Man Who Created Zoolander" (8 minutes) is a mini-documentary centering on the late writer who was part of the team who made the Zoolander character. "Youth Milk" (90 seconds) is a complete version of the weird commercial seen in the film.